Now that we’ve finished the grand opening and we’re all cleaned up, it’s time to offer some workshops. We have three workshops this fall and we’d love you to join us. Learn how to make historic or modern bindings, good for sketchbooks, journals, or gifts for the upcoming holiday season. We also have a one night workshop to let you try out the tools and materials, and you’ll still go home with a few little books as well. 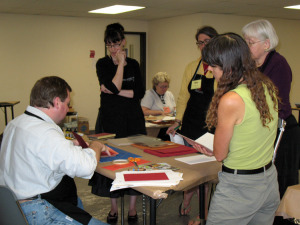 The specific dates and how to register are available on our website at https://bigriverbindery.com/26-2/. This entry was posted in Uncategorized on November 3, 2014 by bigriverbindery.